The following originally appeared on Seminarian Casual, a blog by seminarians at St. Charles Borromeo Seminary, Wynnewood. On the morning of Holy Thursday, the aisles of the Cathedral Basilica of SS. Peter and Paul in Philadelphia were overflowing. In the basement, permanent diaconate candidates and their wives were orchestrating the distribution of holy oils for every single parish. The seminarians were jammed into the back of the side chapel, vesting anywhere they could find room. The permanent deacons were making their way across the parking lot to join in the procession. The priests of the diocese were catching up with each other and sharing the latest news before they renewed their priestly promises together. 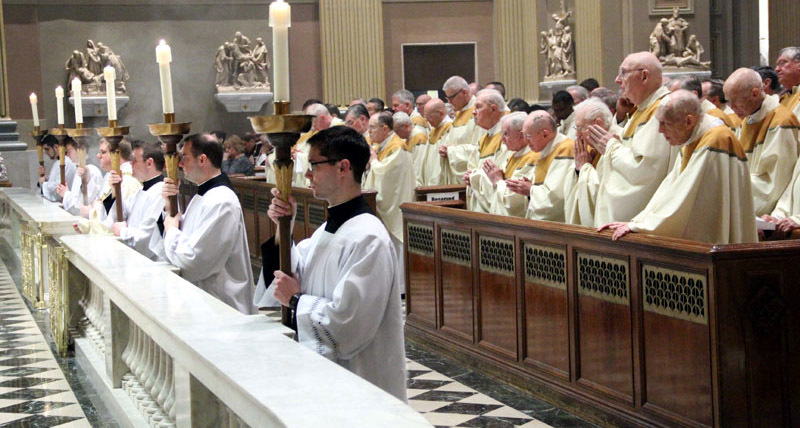 The Chrism Mass at 17th & Race is a scene of ordered chaos before the Liturgy takes place. There is an excitement about the place that is too palpable to deny. But if you’re anything like me, big crowds and fast-paced action can become overwhelming when all you’re trying to do is remember your cues and pray that the chains on the thurible don’t tangle. Shortly before the Mass began, I was in a nervous rush trying to make my way from the sacristy across the long, bricked hallway that stretches behind the sanctuary of the Cathedral when I was stopped dead in my tracks. Bishop Louis A. DeSimone, retired auxiliary bishop of Philadelphia, was now walking in front of me at a much slower pace. I no sooner started to think of how I could graciously get in front of him when he stopped dead in his tracks. Just my luck. Unaware of my presence behind him, he turned and raised his arm in blessing and began to utter one of the most beautiful prayers I had ever heard. It wasn’t until he began making the sign of the cross and begging God to grant them eternal rest that I realized what I was witnessing. On the other side of the brick wall that enclosed us is the altar of the Cathedral. And right below that altar is the crypt that houses many of the deceased bishops of Philadelphia – Egan, Ryan, Dougherty, and Krol to name a few. In the midst of all the hustle and bustle, the glad-handing of the who’s who of the Philadelphia Presbyterate, and the last minute changes to what we rehearsed, there stood before me a man stopping for a moment of quiet prayer. It was a beautiful moment that no one saw. And that makes it even more beautiful. Because it was genuine. The sincere witness he offered that morning helped put everything into perspective for me. It reminded me what my only real job that morning was – to pray. Suddenly, I wasn’t so nervous anymore.